Hey guys. So, title says it all. So, I’m going to resign this blog, but before you shower me with comments including rage and sadness, I’d just like you to hear my reasons out. I have actually lost interest of this blog. Not to hurt anyone’s feelings, but this blog is.. dull and uninteresting for me. Between being an editor and actually getting to post and being a viewer and actually view and comment, I would actually pick the second over the first one. Besides, this blog feels so empty and inactive. Like, no one’s even posting. Working here isn’t a treat to me anymore. I’m pretty sure it’s more beneficial for a blog to have active authors than to have an author who BARELY posts. I just don’t want to take up the space. I mean, someone out there probably deserves it more than me. This blog has had a good run. I had a good time, reading the posts, reading your comments, etc. But it’s just too much. Now, before I say goodbye, I’m going to give thanks to…. The authors/editors, for giving me a warm welcome, and helping IC by posting, commenting, etc. And best for last, IC, for making this wonderful blog, doing AWESOME things, doing hard work, and you know what I mean, Keep on blogging! Don’t worry, I’ll still view this blog and comment 😉 . I might be back someday, but I highly doubt it. I’M MENTIONED ON HP’S POST!!! Yep, I sent it, and lets just say I didn’t regret it at all. For now on, every time I finish an episode, I’ll send it for issue [insert here]. Well, that’s just it for me. Now here’s the other mention (this one was found by author Magic Fire and Smart K): PHB author HPuterpop won the Golden Noodle award for (I dunno the award, and yes, I watched the video) drawing Think’s poptropican (and it was a fabulous drawing!). Congrats HP! Well, that’s it! See ya next time! So I’m sorry, but think of it this way. It’s better that I leave. I got IC motivated to get back online, so now others can help her do so. Now, someone else can have this Author Position and use it for good. So on so forth… Of course, I’m being pretty selfish. I should’ve made this post almost a week ago. But there are a lot of things right now that are testing me… Testing whether or not I’ll not just leave the blog, but leave blogging… Don’t think that this is a definite resignation from the interweb. I’m just getting started (Yes, a year and almost 10 months into it…). And you’ll still see me around, bugging the heck outta someone. But this is goodbye. Now, being a Whovian, this wouldn’t be a Goodbye without a quote. A good quote. A quote that’s honest. But I don’t wanna go. And then there’s the long quote. The quote that I was afraid of messing up, so I googled it. The one that Google redirected me to a CLOCK WEBSITE FOR<<< The one that makes me think of all the things I could’ve, and should’ve, done with this Author Position. Times change and so must I. We all change. When you think about it, we’re all different people all through our lives and that’s okay. That’s good. Gotta keep it moving. So long as you remember all the people who you used to be. I will not forget one line of this, not one day I swear. I will always remember when The Doctor was me. No, not that one, I just thought it would be good measure. The Eleventh Hour. It’s a bit of a poem to me I suppose. And now it’s time for one last bow, like all your other selves. Eleven’s Hour is over now, the clock is striking Twelve’s. So I’m 11… Guess it’s time for 12 to come forward then eh? I’m going to be inactive. Yep, for 3 weeks. The reason being is because of a relative’s wedding (I have to get at the flight tomorrow, ever so early). I might be on, but it’ll be unlikely, because of the connection. I also have like, piles of homework toppled in. I’m doing cyber (online school, sorta), so I won’t need to do piles of paper work. Also, I am working on TTSOBC, which I am afraid will have to get delayed for a long time. I will be back in October 23 (Thursday). Survival Episode 5- Out for members! The hunt is on! In the darkness before dawn, can you turn the tables on your pursuer and escape the woods once and for all? Well, you can ignore the title I guess, but it actually has something to do with this post! 😛 Anyways, the creators have released a soundtrack album featuring, well duh, Poptropica Music! Wait a minute, but what’s that? ❓ Under where it says, ‘Featuring music from,” you’ll see the Shrink Ray and Back Lot island logos! :O So that does mean that Back Lot and Shrink Ray will be next to be updated! 😛 A lot of Poptropicans have been asking for this, so the creators did it! 😀 Now you can listen to your favorite Poptropica music on the go! 😉 You can buy the full volume (for REAL MONEY!) for $8.99 on Amazon, or for $9.99 on iTunes. You could also buy individual tracks for $0.99 each. 😉 There will be more albums in the future probably. Well, I saw a picture for them and I forgot where I saw them. XD Sorry. 😦 😳 Anyways, be sure to check it out! I’m Magic Fire (wait, I already said that didn’t I), but you can call me MF or Magic, or really whatever you want. Well, I’ve been playing Poptropica for about 3 years now and started blogging about it in December. 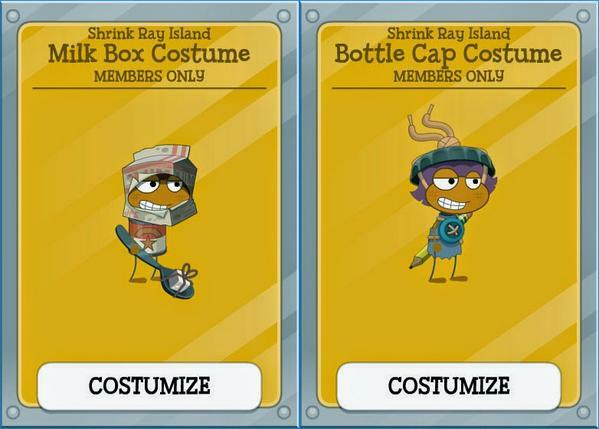 I have my own blog, The Poptropica Package, which is also now having a costume contest in honor of 3 thousand hits! My username, if you want to friend me or look at my costume of something, it’s pop123tropica15. 😉 I know it’s strange, don’t judge. 😛 I like pizza, drawing and reading. Well, that seems about like all you need to know about me.